Plan For Vacation Day is Here! See You in Pensacola! Pensacola, Fla. (Tuesday, Jan. 29) – Every year more than half of Americans (52%) fail to use all their time off, creating a stockpile of 705 million unused vacation days. The most effective remedy for American workers who want to use more vacation days is better planning. Yet just over half (52%) of households set aside time to plan the use of their vacation time each year. 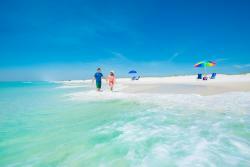 Curious what a vacation in Pensacola would look like? What&apos;s your daydream? Days spent lazing on sugar-white sand? Soaking up the charms of a locals-love-it downtown? Roaming the halls of a pre-Civil War fort? Getting in touch with your outdoorsy side? The Pensacola Bay area delivers the experience you crave. Even better – you have options...pick just one way to spend your time with us or mix and match as it suits you.